The idea of trinity is the central theme in many Hinduism religion variants, and is probably duplicated even outside of Hinduism in early Egyptian religions, Christian trinity, later Greek religion mythology etc. In the context of Hinduism, the idea is both simple and complex at the same time and can result in a profound understanding of the nature of universe, life and how we mortals try to understand God. Trinity in Hinduism tries to view a very critical aspect of the universe and how it works. Starting from the basic tenet that every beginning has an end, every material thing in this world goes through a basic life cycle of creation, existence and destruction. 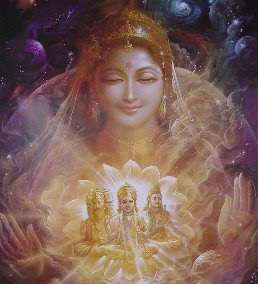 So, in Hinduism trinity - Brahma is associated with creation or beginning, Vishnu is associated with life/existence/maintenance and finally Shiva is associated with end or destruction. But what most non-Hindus (and many Hindus) find confusing is that the idea of trinity seems to insinuate that there are three different "types" of gods and they all do different things! And I guess here the seemingly simple concept of trinity takes a more complex and profound turn. The most fundamental concept in Hinduism is that of oneness - All is one and many is just how we tend to see the one. Think about our sense of taste for example - When we are hungry, a loaf of bread tastes like the most delicious thing we ever had but when we are full loaded with an extra large pizza then the same loaf of bread will be unbearable to chew! Its the same bread but our perception has changed and we taste it in two different ways based on how we "want" it to taste! This was a very simple example to explain the concept of oneness in "perceived" manyness but it applies to almost everything in the world around us and how we tend to perceive and understand it! In our current discussion, this concept applies to how we tend perceive God - All the different religions (Buddhism, Islam, Christianity, Jewism etc etc) have different notions of God regarding where He is, how He looks like, how to pray, what book to read for Him, what to eat and what not; but in the end they are all praying to the *same* one God! So fundamentally, Hinduism doesn't claim to be the best or worst of all because all are basically the same but this is a different discussion and I'll be writing about it in more details soon....Getting back to our current discussion, the trinity doesn't imply three different gods, rather it implies three different aspects as understood/viewed by humans of the same One God. Now another question that might come to mind is why do we need three aspects at all but that is again out of scope of this post and I'll be adding a post dedicated to it soon. Now when we have the three God vs one God out of the way and we have got the basic understanding of the concept of manyness vs oneness, I can write in more details about what the concept of beginning-existence-end implies. The concept of oneness, when fully understood, results in the profound realization that there IS no beginner-existence-end! The "end" is hidden in the "beginning" itself and "beginning" is hidden in theh "existence" and "existence" is hidden in the "end"; in other words the basic causal nature of the process means that all three are one and the same and must be understood so by someone with a transcendal view of the world! This has a profound and deep implication on our views and reactions to things happening in our lives - One layman example - you lose a lot of money today but you realize that "losing" part was rooted in the "gaining" (when you won that money in the lottery) so there is no sorrow but a clear and calm state of mind. No outer upheavels in life affect you and if you truly understand the concept then you can never get depressed or frustrated about things going wrong in the life! This is ofcourse a very tiny gem of how different parts of Hinduism related to one another and how simple concepts learned from Hinduism can be applied to our lives. how is the creater of earth . Brahma, Vishnu and Mahesh are three divine forces emanating from God Almighty that are manifested into everything in the universe. These three forces are continually and perpetually at play either conflicting or complementing or amplifying each other. I suggest a correction: Mahesh or Shiva does not destroy. It merely transforms.